To find a unique voice on so ubiquitous an instrument as the acoustic guitar is quite an achievement: to do so within a centuries old idiom where the instrument has no real history is truly remarkable. Tony McManus has come to be recognised throughout the world as the leading guitarist in Celtic Music. From early childhood his twin obsessions of traditional music and acoustic guitar have worked together to produce a startlingly original approach to this ancient art. In Tony's hands the complex ornamentation normally associated with fiddles and pipes are accurately transferred to guitar in a way that preserves the integrity and emotional impact of the music. Tony's first self titled recording in 1996, followed by Pourquoi Quebec in 1999 led to worldwide recognition. However, it was with the release of Ceol More in 2002 that Tony's stature as a first class musician reached a new level. Critics hailed the focussed, spell-binding nature of the music, from the plaintive Jewish hymn "Shalom Aleichem" to the ingenious arrangement of the Charles Mingus classic "Goodbye Pork Pie Hat". Having been nominated as Musician of the Year by both the BBC Folk Awards and The Scottish Traditonal Music awards, in 2002 "Ceol More" hit the Critic's Album of the year list in Acoustic Guitar magazine and named "Live Ireland Awards" Album of the Year. Tony's work has come to represent Celtic music in the guitar world, making regular appearances at guitar specific events where just a few years ago jigs and reels would be unheard of. He is invited annually to the Chet Atkins Festival in Nashville, has appeared at Guitar Festivals in Soave and Pescantina, Sarzana and Francacorta Italy; Frankston, Australia; Issoudun and Bordeaux France; Kirkmichael, Scotland; Bath and Kent, England; Bochum and Osnabruck, Germany. In 2004 he appeared at the famous Ryman Auditorium in Nashville in the "All Star Guitar Night" featuring Steve Morse, Bryan Sutton, Muriel Anderson, Béla Fleck and Victor Wooten and headlined by the legendary Les Paul. Today his live work ranges from intimate solo performance through his trio with brothers Gary and Greg Grainger to the quartet Men of Steel (with fellow guitarists Dan Crary, Beppe Gambetta and Don Ross). He is an enthusiastic collaborator both as a leader and as a sideman having worked with, among many others Dougie McLean, Phil Cunningham, Mairi MacInnes, Liam O'Flynn, Martin Simpson, Kevin Burke, Alison Brown, Martyn Bennett, Natalie MacMaster, Patrick and Jacky Molard, Mairead ní Mhoanaigh and Dermot Byrne, The Nashville Chamber Orchestra, John Jorgenson, Jean Michel Veillon, Catriona Macdonald, Seikou Keita, Xosé Manuel Budiño, Ewen Vernal and Andy Irvine. His 2009 release "The Makers's Mark" saw him showcase 15 of the finest luthier built guitars available. 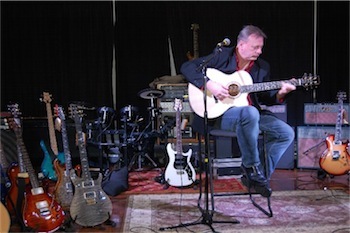 Recording a solo piece on each instrument, the project caught the attention of the mainstream rock guitar press in a way that acoustic work rarely does. The following year, a chance hearing on Irish radio led to an invite to contribute music to the soundtrack of Oscar winning director Neil Jordan's film "Ondine" starring Colin Farrell. Never one to be typecast, Tony's new album "Mysterious Boundaries" is his most ambitious to date. An encouraging challenge from mandolin virtuoso Mike Marshall to learn the Bach E Major Prelude on guitar led to an exploration of classical and baroque music – seemingly very different to the jigs and reels that he grew up with. By examining the boundaries between genres and sticking to his steel string guitar (rather than the conventional classical guitar) McManus has produced a work of great originality and beauty, hailed by his peers as "a masterpiece" (Renbourn), "beyond beautiful… it's PERFECT!" (Tommy Emmanuel) and which contains a truly remarkable rendition of Bach's colossal Chaconne in D Minor – one of the greatest compositions of any age.